Ruck It Up " chronicles the post-Cold War transformation of a traditional tank-heavy corps for the defense of Western Europe to a lighter reaction force readily deployable within the U.S. European Command area of operations. Charles E. Kirkpatrick discusses the changes that affected the Army at large while recording the organizational, technical, and tactical lessons learned by the forward-deployed units in Germany-the U.S. Army, Europe, and its principal tactical formation, V Corps-during post-Cold War operations, including Bosnia and Kosovo. Among the many lessons was how flexible, durable, and functional conventional general-purpose forces were in coping with a range of missions from humanitarian intervention to combat operations. 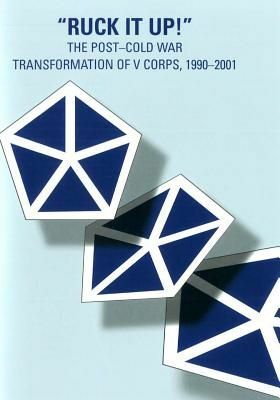 Kirkpatrick lays the essential groundwork to understand the subsequent successes of V Corps, which rapidly deployed to Southwest Asia in 2002 and then conducted U.S. Central Command's main attack during Operation IRAQI FREEDOM in 2003. Those engaged in the task of refining the U.S. Army's organization, roles, and missions, as well as those who wish to gain an understanding of the complexity of post-Cold War operations, will want to review Kirkpatrick's invaluable microcosm of change.